At the time it happened, I expressed regret over the fact that Jonathan Papelbon’s signing meant the likely end of Ryan Madson’s career as a Phillie. While I still feel that way, Saturday’s news that Madson will need Tommy John surgery and won’t throw a single pitch in 2012 suddenly makes the Papelbon signing and Madson’s subsequent departure much easier to take. I have read very little in the way of blogger reaction to the news, but I assume that it’s plenty similar to mine: given all the injury problems plaguing the Phillies at this time, if they had resigned Madson in the hopes of using him as their closer then the season would suddenly be on life-support. None of this should be construed as wishing my being glad it happened to Madson — nothing of the sort. The only people who know exactly what transpired during the Madson-Phillies contract negotiations are Madson’s agent, Scott Boras, and Ruben Amaro. Whatever happened, I understand that baseball is first and foremost a business. Madson’s departure in no way reflected upon his time with the team, him as a person, or the type of ballplayer he is. I wished him nothing but the best in Cincinnati — provided he blew every save opportunity he got against the Phillies. Hopefully, he will be one of the lucky ones and his career will get back on track after the surgery. In the meantime, while I’m breathing a sigh of relief that this injury didn’t impact the Phillies, it is a reminder that this type of injury can happen to any pitcher at any time. The fact is that throwing a baseball at speeds of 90 MPH or more is physically very stressful — the fact that the human body is capable of achieving such an amazing feet does not mean that it’s something one should be able to do on a consistent basis for years on-end. Pitchers like Steve Carlton, Nolan Ryan and Greg Maddux are freaks of nature. 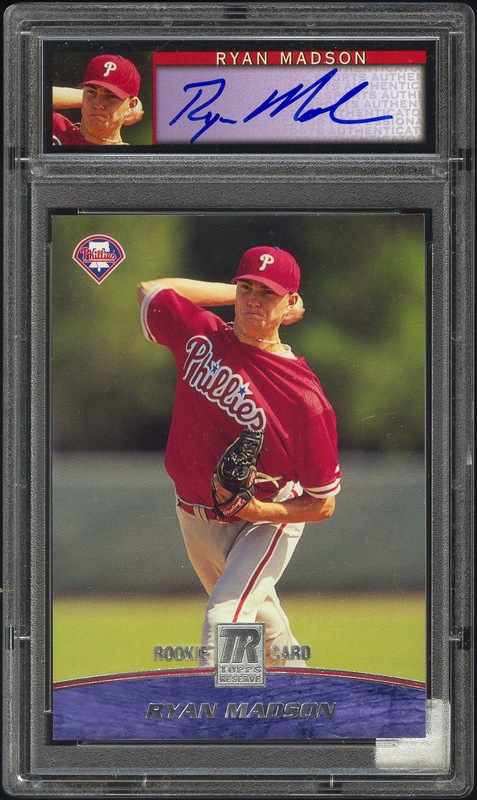 Major arm injuries during a pitcher’s career are the norm, and this type of thing could happen just as easily to Roy Halladay, Cliff Lee, Cole Hamels, Papelbon, or anyone else on the staff… at any time. I don’t know if “Mixed Feelings” correctly captures my sentiments on the official announcement of the Jonathan Papelbon signing last week, but it’s close enough for blogging purposes. While I accept the realities of player movement within the sport, like many fans I also wish to see the home-grown core of the team to remain as long as possible. 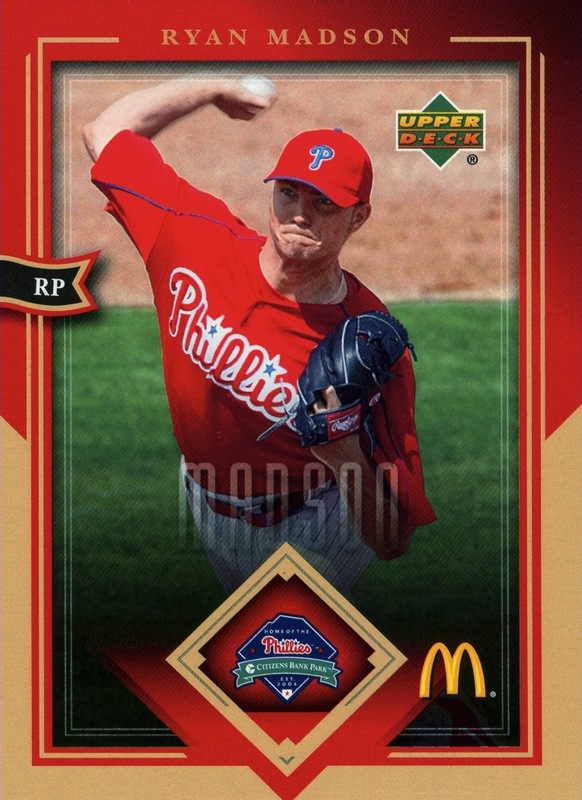 Thus, I was really hoping that the Phillies would find a way to retain Ryan Madson for the next few years. In fact, I was really excited when rumors originally started circulating that the Phillies and Madson were close to an agreement. Despite the rumors and reports provided by “anonymous sources,” we’ll never really know exactly how close Madson and the Phillies were or the real reason why the talks broke down. 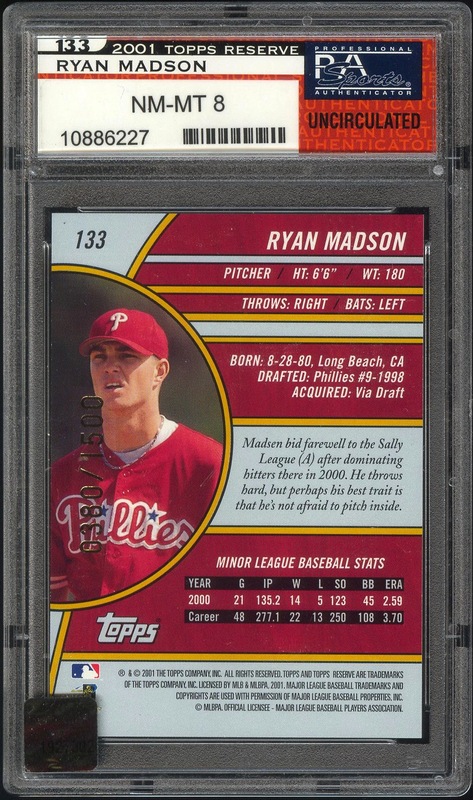 In my mind, one of the biggest disappointments regarding the Papelbon signing and Madson’s exit from the club (yes, I do understand that the Phillies could still potentially resign him to resume his setup role, but the chances of that happening are roughly on par with Pluto regaining its status as planet) is that it almost guarantees that the Phillies will continue their decades-long streak of being unable to draft, develop and keep a closer. It’s somewhat frightening to acknowledge three different things: 1) Jose Mesa is the franchise career leader in saves; 2) Mesa only saved 112 in a Phillies uniform; and 3) Ricky Bottalico holds the franchise mark for most saves by a player developed by the Phillies farm system (78). Having said all that, assuming that the contract signed by Papelbon is roughly similar to the one the Phillies and Madson attempted to negotiate, I would take Papelbon over Madson as my closer. However, that’s a decision made solely by my head, not my heart. Of course, I’d rather see the man who already holds the franchise mark for most career appearances stay for another four (or potentially five) more years and have the opportunity to set the franchise records for career saves as well. Unfortunately, constructing the best team possible means making decisions such as this one, and for that reason alone I don’t envy Ruben Amaro for his job. It’s easy for a rabid fan to state what he/she would do differently, but such fanaticism can potentially make it harder for you to make the right decision. There’s a good chance that this change of personel could come back to haunt Amaro and the Phillies (this is true of any free agent signing), but right now it appears to make the club better, and in the end that’s all you can really ask for. Never let it be said that here at 14,000 Phillies we don’t take note when a Phillie does something historic. True, we might be a little slow in publicly recognizing the particular event, but we’ll get there eventually. 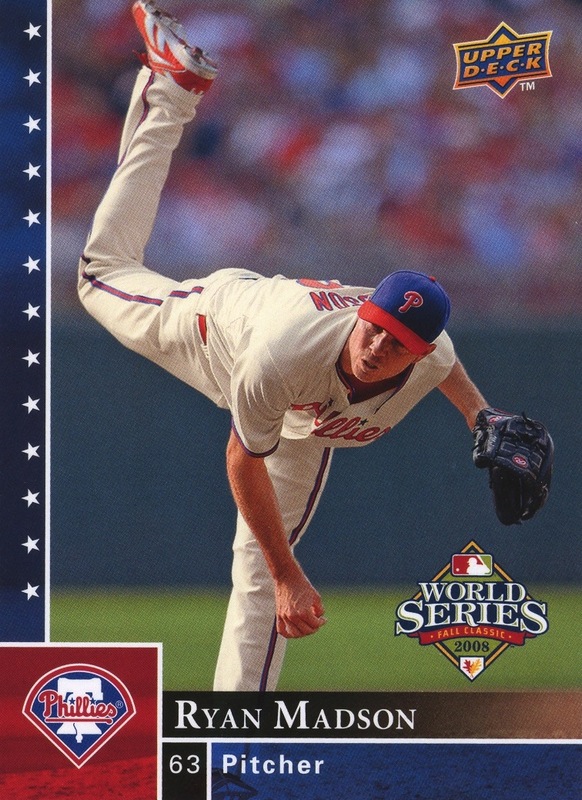 Case in point: on Friday night, Ryan Madson became the Phillies all-time career leader in relief appearances, passing Tug McGraw for the #1 spot. Given that he’s a free agent, he’s represented by Scott Boras and the Phillies already have a significant amount of money guaranteed to various players in 2012, there’s a good chance that his run with the team will end after this postseason. Hopefully, that won’t be the case. However, he is now 31 and the last thing the Phillies need to do is spend a lot of money on a player on the wrong side of his prime years — they already did that with Lidge and Contreras. 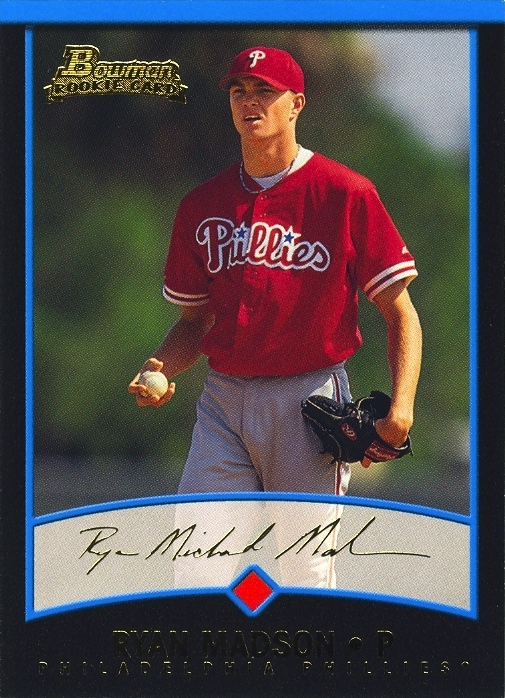 On the other hand, Madson did give a hometown discount to the club when he became a free agent after the 2008 season. It will be interesting to see where that goes. By the way, I used the Gold parallel of his rookie card knowing full well I haven’t followed up on my last post about parallels. Rest assured that it is coming — I just got a little distracted by the 14,000 Phillies Originals project.